I came across a Food & Wine recipe for flourless peanut butter cookies in The Tennessean over Christmas and jotted it down. Then I thought — hey! NUTELLA! Because, you know, it’s Nutella. How could it NOT be good? Because these are flourless they crisp up a lot as they cool. You can control the thickness with cooking time; around 10 or 11 minutes gets you a thicker cookie; more than 12 minutes gets you a crisp, thin wafer. Both are crispy after they cool, and both are fabulous. Make a tray of each and see what you like. Take them out just after cracking for a thicker result, or let them rise, crack and fall for thinner crisps. Oh these must be AMAZING!!! 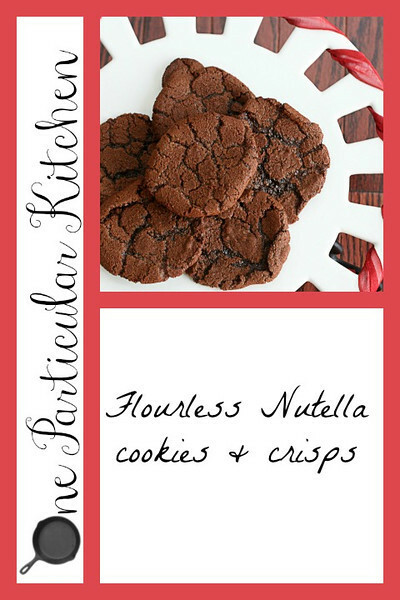 I’ve never tried Nutella b/c of the hazelnut, but these brownies look amazing. And look how short that recipe is!!! I mean cookies!! They look like brownies haha. Hazelnuts and chocolate are great flavors together. These look wicked good! Made these last night. Light and crispy and good!! And so easy to make. I can’t wait to try these! Yum! These look so easy! And yummy too! I’m definitely going to be trying these out when my stepkids visit this summer! Thanks for such a quick, easy fix. So to make the peanut butter ones, all you do is replace the nutella? Hmm… I wonder what a bit of both would be like? OMG. I tried the flourless peanutbutter cookies and had the same thought. I haven’t had a chance to try it. They look amazing. I can’t wait to try them. YUM!! I am so making these!! OMG I WILL TRY THIS NOW . I tried these, put them in for 10 minutes exactly and they flattened thinner than a wafer. What the heck did I do wrong? I even chilled the batter for a while. Oh no! I wonder if the oven was too hot? For cookies you want to pull them out of the oven as soon as they start to crack on the top. Did they taste good? Maybe crumble them over ice cream! Yep, that’s what I meant — I wonder if the oven was running hotter than it was set, you know? Mine appears to take temperature settings as a mere suggestion so I have to keep a thermometer in there (insert eye roll). Good luck! Fingers crossed! !